This thread deals with the basics of Islam, and aims to dispel myths and misunderstandings. Please refrain from embedding pics and vids in this thread, to keep it clean and facilitate flow. The main sources for this thread are Seekers and Qibla course materials, Masud's online aggregation, research conducted by RISSC English Publications, and lectures/material from the Zawiyah Institute in Walmer Estate, Cape Town. Islam is based on belief in the One God (Allah). It was founded by the Prophet Muhammad (570-632 CE), to whom God revealed the Quran. The resulting religion, however, was not a new message, but a final restatement of God's messages to previous prophets and nations (such as the Hebrew prophets and Jesus Christ) since the time of Adam. The Quran also mentions the existence of other prophets, and does not exclude the possibility of ancient religions other than Judaism, Christianity and Islam with authentic roots. "And verily we have raised in every nation a Messenger [proclaiming]: serve God and shun false gods …" (Quran 16:36). "One day when we were sitting with the Messenger of God, there came to us a man whose clothes were of exceeding whiteness and whose hair was of exceeding blackness, and there were no signs of travel upon him, although none of us knew him. -1. The 2 testimonies of faith (inward meaning: acknowledgement of God). -2. The 5 daily prayers (inward meaning: attachment to God). -3. Giving alms or Zakat— 2,5% of one’s annual disposable wealth/savings to the poor (inward meaning: detachment from the world). -4. Fasting each month of Ramadan (inward meaning: detachment from body and ego). -5. Making the Hajj (inner meaning: to return to one’s true inner heart - the mysterious square, black-shrouded Ka’ba in Mecca being the outward symbol of this heart). Interesting thread. We should have one for Christianity too. Perhaps Arthur will indulge us. You should book the first 15 or 20 posts in this thread, so you can easily refer back to a question already answered, or a particular section already posted. And readers can read your posts sequentially without having to search through a multitude of other posts. Ah! Was wondering if this would happen. Cool. I think you were one of those who requested Intro threads for the various religions/beliefs way back. I have decided to use a contents link system, based within the original post, to guide readers along the flow of topics. This will, in turn, allow discussions to flow naturally. Should have on Atheism too, but I think it will be blank. Cool thread. I know very little about Islam and by very little I mean nada. What would qualify as major sins? Reason I'm asking is that I met a Muslim chic a few weeks back, and she sent me a few nudes on Friday (don't ask). Is that a forgiveable sin, and if not, under what circumstances would it be forgiveable? The next time she sends you nudes, reply with "astughfirullah"
I'm assuming Caliph is some form of ruler/title? Hadith a memoir or letter? Just one thing wrt fasting. My observation: It seems to me that during this period muslims eat MORE than any other time. Doesn't this period call for abstinence instead? Thnx for the info guys. 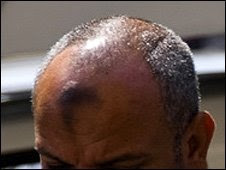 Why do some muslim men have dark marks on their foreheads? Probably from the prayer position. Edit : seems I was correct it even has it's own wiki page! Some Muslims also believe that on the day of judgement, this bump will particularly fluoresce an immense white light. Apparently some men deliberately use rougher mats (eg straw mats) and rub their heads harder to get this mark since its a sign of piousness. Also, some men have similar marks near their ankles.